The rate of change of future earnings estimates tells us where stocks are headed. As you can see from the chart below, the decline of 2019 estimates coincided with the 20% correction in the S&P 500. Estimates cratered whether you exclude energy, financials, or tech. The ex-tech segment started at the lowest growth rate and ended at the highest growth rate which shows us tech was a major reason overall estimates fell as tech growth was revised lower. We have anecdotally seen this already with Apple’s negative earnings pre-announcement which was catalyzed by weakness in China. Q4 EPS growth is still expected to be 10.51%, but Q1 2019 earnings growth is expected to be 5.02%. That’s a decline from 6.26% on December 1st. These estimate declines are either going to make it easier for firms to beat estimates or are an accurate representation of the current economic slowdown. The first few firms to report Q4 results haven’t indicated positive momentum. 67% of the 18 S&P 500 firms that have reported Q4 earnings have seen their Q1 estimates cut afterward. The average cut has been 5.29%. Last quarter only 59% of firms had estimates cut; they were only cut by 0.35%. The obvious negative news is the rate of change in earnings estimates. 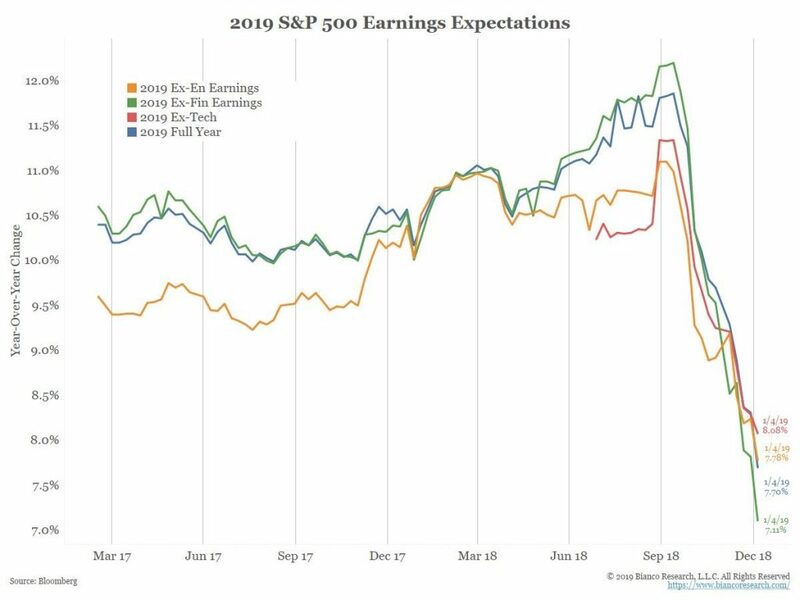 The good news is if S&P 500 earnings growth is in the mid-single digits, it doesn’t justify a bear market unless investors are pricing in a recession next year. Stocks already fell in 2018 on very high earnings growth which shrunk multiples sharply. If stocks were to fall on mid-single digit earnings growth, multiples would be very low.